Domino’s Pizza presents a brand new online sitcom based around current football events. 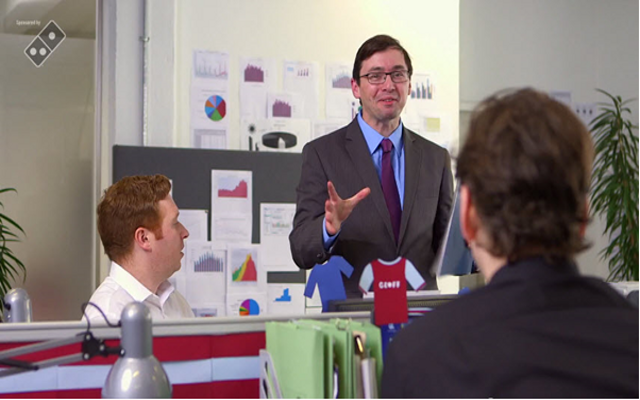 Each episode revolves around football-obsessed work colleagues; Geoff, Spencer, Ronnie and Martin, and their daily work in an office environment. There conversation exclusively centering around their shared love of the game, leading to amusing interactions between the group in a mock-umentary format that is not unlike that of Ricky Gervais’s Office sitcom. The comedy is based on a group of office workers who share a love for the Beautiful Game and include an Aston Villa supporter, a lifelong Chelsea fan and a couple of Man United supporters, one of whom is a Mancunian and another a rather stereotypical southern based follower of the Premier League title holders. You may well recognize your football obsessed friends in the characters, and indeed you may personally resemble one of the main cast, as each role portrays a supporter ‘type’ that does in many ways ‘hit the spot’ when it comes to capturing the idiosyncrasies and attributes of some who follow the game avidly. The boss is of course a classic ‘Plastic’ Man United fan. Below is one of 11 episodes, which appear online every Thursday until the end of the current campaign.